Masai Ujiri might have a full time job as the President and General Manager of the Toronto Raptors, Canada’s only team in the NBA. But he is also fiercely dedicated to youth development in Africa. Born and bred in Nigeria, Masai realized that there is an abundance of basketball talent in Africa but the players were often referred to as “raw”. This means they lack experience in the game and have little to no access to coaching and facilities. In 2003, he founded the Giants of Africa (GOA ) and began to use basketball as a tool to make a difference for kids in Africa. He draws from his experience as camp director for the NBA’s Basketball Without Borders program to model the Giants of Africa camps. His message; “Dream. It’s okay to dream and it’s okay to dream big.” Fast forward twelve years later and Masai still goes back every year with a team of close friends and colleagues to host camps with his foundation. This year, Masai and the GOA extended their reach and held camps in four countries; Nigeria, Ghana, Kenya and Rwanda. I was fortunate enough to witness Masai and his team in action after spending two days with The African Perspective in Nairobi covering the camp. Below is a snippet of what went down. Last year, GOA visited Diwopa primary school in Kayole, one of the toughest neighborhoods in Nairobi and promised to build a full court for the youth of this community. No one anticipated the emotions the moment would bring when the court was finally completed. 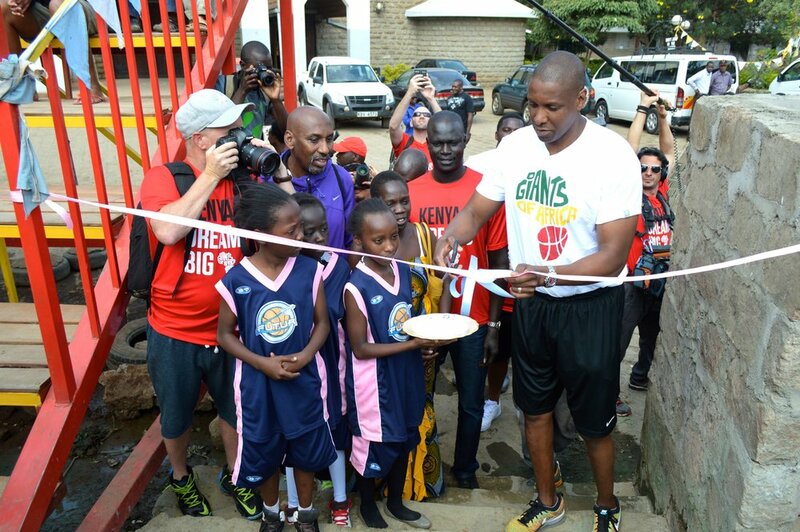 Masai and his GOA staff attended the official launch, an official ribbon cutting ceremony was administered, and a priest led a prayer and blessing of the field before the GOA staff put a vibrant basketball clinic together for the kids. The atmosphere was electric throughout the whole clinic. Members of the Diwopa basketball community and parents then gathered at the centre circle to express their gratitude to a vividly emotional Masai and his team. They thanked him for being a brother, a friend and for believing in their community while promising that they would continue to nurture the kids and to take care of the newly opened court. One of the parents, selected to thank Masai and his team on behalf of the community became so emotional that he had to remind himself that “African men don’t cry”. But who can blame the man, things like this rarely happen in places rampaged by crime and drugs like Kayole. In my years living in the slums of Nairobi, I’d never seen something that gave so much enthusiasm and hope to a community than this court had done. On his part, Masai composed himself and spoke from his heart. Thanking all those who had helped and promising that GOA would continue to partner with the community in making sure that the court stayed in good shape and that the kids had somewhere they could go and play. Strongly remarking that he was once one of these kids growing up in northern Nigeria and that it will be interesting to see what comes out of the court in the next 10 years or so. You opened the Diwopa Kayole basketball court yesterday, take me through the whole experience, what does it mean for you to be doing that for communities like Kayole? Yesterday was an unbelievable day. I cannot describe it; it was a very special day for the Giants of Africa and myself. I still don’t know what to say. You want to affect the youths and areas that have less opportunities and Kayole is one of them. Seeing all those kid smile yesterday and how happy people were, the energy and the passion inspires you to do more. Such a magnificent day in Kayole and I was deeply moved. The plan is to get them bigger but the challenge on our part is how to sustain it and how do we make it a year round program for this kids where we are not just coming and affecting them for a few days in the summer. We want to affect them all year round but for that to happen we will need more facilities. We are appealing to businesses, to brands and to governments in order to get facilities we can continue to use all year round. That’s where we have to get better. Our goal is not to get scholarships for kids to go to America – we used to concentrate on that in the past and I thought it was the wrong focus! What happens to the kids that are not good enough? Where does that leave them! We are trying to develop their skills but we are also trying to develop basketball as a tool. If they continue to play the game passionately, and they go to school here or wherever else they go they can use the game to focus on other things they can do in life! All three (GODWIN, PATRICK, MASAI) of us never played one game in the NBA. My colleagues here who work for the Raptors never went to college in the states! That said, the kids that are good enough are always going to go, if you have enough talent, coaches are always going to find you, schools will always find you. We are trying to affect the ones that don’t make it to that level! There are other aspects to the game as well; there’s sports journalism, there’s sports marketing and management; sports has opened up so much now that these kids need to start thinking about other options other than the NBA and that’s one of the other things that we want to pay attention to. Give these kids tools to succeed outside the court. Drake is passionate about what he does and is passionate about basketball. Honestly, you have all these different relationships with people and I have been blessed to know a lot of people like that but I don’t try to push them to do things that are not within what their strengths is or what they like to do. But I’ve never asked Drake, honestly it’s never crossed my mind; I work with him very well with what we do for the Raptors and his very very supportive. He has been supportive of some of the giants of Africa events that we’ve done in Toronto and that’s good enough for us. He plays basketball but I don’t know if he will be working with kids here anytime soon but I really appreciate the friendship and the support from him and all he does for the Toronto Raptors has really taken us to a great level of exposure. You know, when they give me bread, I don’t ask for the butter too! I just eat the bread… that’s what my father taught me (laughs). With the schedule you have, why do you keep coming back here every year? You spoke about engaging the local community, what is GOA’s outreach plan? How do we make the local community part and fabric of what GOA does here? We are still working on how we engage more people. We're setting a template of how we will approach this as we continue to go to more countries hence increasing our network of people. We are opening more doors and when people come and see what we do I think it will encourage them to come on board so we have to stay consistent with our work. Continue to enhance and grow the program even more so it attracts more people that want to work with us to achieve bigger things. We are open-minded; we look for anything that is going to enhance the youth in Africa and things that make sense. We have to figure out how to build the youths and use sports as a tool; it’s really important to us and finding the right partners is something that we are looking at – we do need money because again we need to build facilities. We are looking to banks, organizations, and companies to come out and help us do something for the youths, get them off the streets and into sports. We are willing to listen to everyone and it’s not all just about money but also things that will engage the youths. How do you envision GOA in the next 10 years? I hope in the next 10 years we can build more facilities. I know I keep coming back to that and stressing it but that’s my dream and that’s my hope that we can go to these countries and there’s facilities where these kids can play everyday and we can come and do camps without having to be a burden on anybody. So in the next 10 years am hoping that a lot of facilities will have been built. I think the NBA has done great. We went from building basketball without borders, to camps, to doing clinics around the continent to setting up the junior NBA. We’ve had a plan in the last 10 years to build facilities, personnel, build coaching and now you can see it with the African players, African personnel, executives; legends are taking part in preaching and growing the game so we’ve make progress from 10/11 years ago since I first started and now for the next 10 years we are studying it and trying to evaluate what we should expect in next 10 years but I think facilities is going to be the main thing; that’s where the focus is going to be. How does it feel to be home? My mom is from here, this is obviously special to me and that’s why I chose Kenya right after Nigeria. President Obama was here a few weeks ago – there’s something special about Kenya and I think we all know that. That’s how I feel and I come back a few times a year even when it’s not related to the GOA. Coming here will always be special to me; I have memories of coming here as a kid and my mom bringing me back here. GOA at the NBA ALL STAR! Will there be an Africa related event? December 5, the day that marks Mandela’s passing we will have an event in Toronto and during the ALL STAR for sure we are going to do something related to Africa. One way or the other we will figure out something to do. We are extremely excited about hosting the all star in Toronto, I believe it will be the first time its hosted outside the US if am not wrong so those two days we look forward too. I first met Masai earlier this year during the African Business Conference at Harvard. Like many others I’d spent hours on YouTube watching and analyzing him. Reading about his story from Northern Nigeria to the years he spent sleeping on friends couches all over Europe as a pro-bono basketball scout. On that day, I was surprised to see how keen he was to interact, taking his time to listen to me- enquiring about my background, what I did for a living, and even asking for my contacts and promising to get in touch! With the type of schedule he has, I didn’t think I’d be hearing from him anytime soon but just a few days later I woke up to an email from him- encouraging me to strive on and asking that I keep him posted with the progress we make at The African Perspective Magazine. This all really took me a back but as I covered the work that Masai is doing in Kenya (Africa) with his foundation, it dawned on me that I was not special … Masai is dedicated to young people, his eyes light up when among them, he spends time listening, encouraging, modeling positive behaviors and even insisting on seating on the same tables and sharing meals with kids at these camps; he wants to empower and to mentor, more importantly, he means what he says when he says “its okay to Dream, Dream big, Dream big around Africa”. Click here to help the Giants of Africa continue to shape the game of basketball for youth in Africa. Is a Fruitarian diet for you?